Doha landscaping crew collecting and taking grass clippings to be landfilled, protecting their lungs from the particulates with scarves. Photo © Nance Klehm. Resourcefulness is measured as how many times a resource can be looped before it leaves an organism. With each pass of a resource, more energy is built instead of lost. Organisms and ecosystems run on positive and negative feedback loops. Positive feedback loops stimulate growth and expand a system, negative feedback loops limit or contain a system within boundaries. Limits, or boundaries or containment, actually help a body to function well and build its resilience – the length of an arm stretching, the containment of muscles, ligaments, bones within skin. When limits are known and boundaries are set, resources are allowed to circulate within a system, nourishing different parts as they pass through and regenerating their energy. 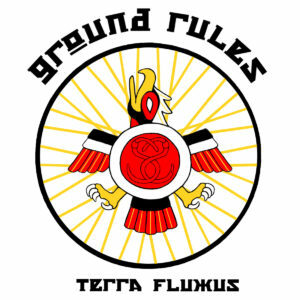 The Ground Rules, a composting and bioremediation cooperative in Chicago, a Social Ecologies project. Grass clippings from Doha park with overly shorn grass lawn in background. Photo © Nance Klehm. 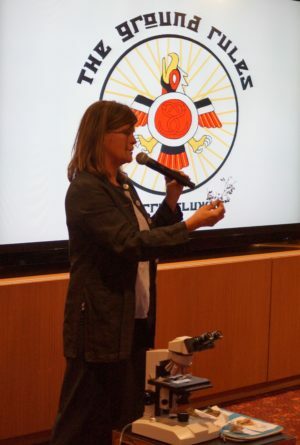 Nance Klehm presenting at the Sustainable Urbanism: New Directions Workshop, Qatar University, 21 March 2016. © Qatar University. An example of a regenerative system is the soil cycle: soil is built from below as parent rock erodes into smaller stones, gravel and sand, producing mineral content; and it is built from above as plants grow and finish their life cycle, leaving their roots and leaves to rot, and insects, mammals, reptiles and birds deposit their manure, feather and bodies to decompose on the surface, to produce organic matter. Wind, water, plant roots, fungi, worms, insects, burying animals and microorganisms all circulate both the minerals and the organic material into a living and breathing matrix – soil – capable of retaining moisture and supporting life as well as absorbing stormwater, filtering air and water pollutants, breaking down inorganic chemicals, and sinking atmospheric carbon. 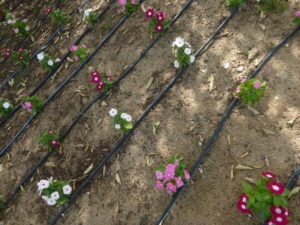 Doha: planting of ornamental annuals – excessive spacing, no mulch to protect transpiration, drip-irrigated using city water, and a variety of annual plant that has no benefit to soil building nor pollinators. Photo © Nance Klehm. An entry point to this: Doha looks at its waste streams. Revaluing its waste streams as foodstocks and redirecting its waste streams to feed other systems within its organism/ecosystem. Object: Much of what Doha now considers waste is actually a valuable input and a start of a regenerative system. 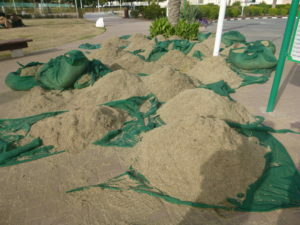 Organic waste from landscape companies, produce and animal markets, restaurants, homes, hotels, office complexes and universities could be collected and composted to create soil amendment and healthy, moisture-holding local soil not dependent on the chemical fertilizers and imported organic materials currently used. Trees that die and pruned branches would be laid down, buried or chipped and allowed to decompose to support fungal communities. Subject: Healthy soil from organic waste reallocation can support resilient and biodiverse landscapes: these living landscapes are filled with fragrance, pollinating insects and birds, and serve as alternatives to shopping malls in that they inspire walking, gathering and conversation in public. Tree-lined parks, playgrounds and walkways cool and hydrate the air. Fresh local food can support edible teaching gardens at universities and schools. Shared home gardens, compost piles and small livestock husbandry could be more commonplace in residential compounds. The proposed future green belt would not be isolated in its concept and function but more integrated into people’s lives via community-designed round tables guided on the principles of agroecology. 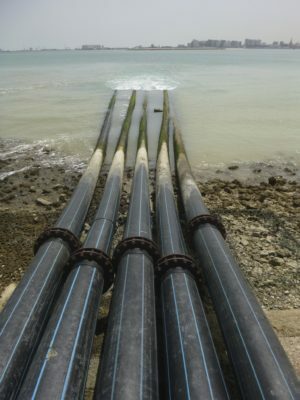 Doha stormwater discharge to the bay along the Corniche. Photo © Nance Klehm. And so, the questions remain: How does Doha define sustainability as a non-Western, but increasingly Westernizing city? Who has the culture of resourcefulness and resilience, and therefore, the internalized values of it? Who has the skills to bring these methods forward? What can ‘Old Doha’ contribute to this discussion? Can these people be brought to the table? Sustainability is about both matter and spirit after all.